JALT has a rich history of publishing material on all aspects of language teaching and learning, as well as of supporting writers in this field. In addition to our three flagship publications below, JALT's special interest groups and chapters offer many journals specific to their fields. A full listing is available here. JALT's bimonthly publication, containing articles related to language education, resources for language teachers, and news and information for JALT members. 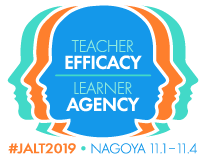 The research journal of the Japan Association for Language Teaching, JALT Journal is published semiannually—in the spring and in the fall—and contains articles, perspectives, and reviews. Produced after JALT's international conference each year, these peer-reviewed volumes stand as a record of our conferences—what was presented, and what was subsequently achieved. For more information on JALT and how to join our organisation, please visit our website. JALT members can access the latest issues of our publications here.